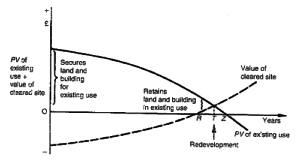 The top line crossing above T – redevelopment, indicates that the value of the vacant site is larger and increasing, as the building value decreases to a negative figure. So the nitty-gritty of all property investment is the timing, as when to buy and when to sell or redevelop. Prior in making these decisions, a well informed overview of the localities in question are required. I suggest that at point (R) on the time-line, the investor should have a clear understanding of the next best investment opportunity. An expert property appraiser, can add value to these rather tough decisions ahead.